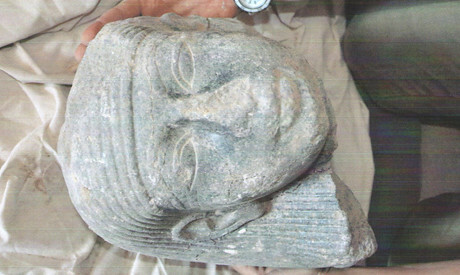 New Kingdom granite head uncovered in Luxor, Egypt. The military regime says its will heighten security near antiquity sites., a photo by Pan-African News Wire File Photos on Flickr. The Egyptian-Spanish archaeological mission unearthed on Thursday a large granite head of a statue of an unidentified New Kingdom king during routine excavation at King Thutmose III’s funerary temple on Luxor’s west bank. Mohamed Abdel-Maqsoud, head of the Ancient Egyptian Antiquities Section at the Ministry of State for Antiquities (MSA), explained that the head is 29.6cm high, 24.3cm wide and 26.9cm deep. The head depicts a round face of a royal figure, not identified yet, wearing a wig, with traces of a broken nose, and two long ears that each reach 8cm. The eyes, he continued, have traces of kohl, with thick eyebrows. Abdel-Maqsoud said that the head was found buried in sand in a pit on the northern side of the second court of the temple. Studies are underway in an attempt to determine which New Kingdom king it belongs to. The temple of Thutmose III is a vey small temple located beside the temple of Queen Hatshepsut at Al Deir Al-Bahari. It was first discovered in February 1962 during routine restoration work carried out by a Polish excavation mission of the Polish Centre of Mediterranean Archaeology led by archaeologist Kazimierz Michalowski. The temple is poorly preserved and was dedicated to god Amun-Re. Although Thutmose III’s actual funerary temple Henkhet-Ankh is located a short distance away, such a temple had played some role within the king’s funerary cult. The Ministry of State for Antiquities (MSA) announced a state of emergency at all archaeological sites and museums in Egypt starting Thursday, in order to deal with the possibility of terrorist attacks and sabotage by Muslim Brotherhood members, after the group was designated a terrorist organisation by the government. Antiquities Minister Mohamed Ibrahim asked Major General Mumtaz Fathi, director of the general administration of the Tourism and Antiquities Police, to take all required measures to tighten security at Egyptian heritage sites. Ibrahim also said that all vehicles will be prohibited from entering any archaeological site or from parking close to sites or museums. A bomb attack in the northern city of Mansoura killed 16 people on Tuesday. Sinai-based Ansar Bayt Al-Maqadis claimed responsibility for the attack. The government on Wednesday declared the Muslim Brotherhood a terrorist group. The Brotherhood has denied any links to the bombing. On Thursday a bomb exploded on a commuter bus in eastern Cairo, injuring five people. Following nearly three years of paperwork, Egypt has succeeded to prove its rightful ownership of a collection of Ancient Egyptian artefacts stolen and illegally smuggled out of the country. The artefacts, currently in custody at the United States Department of Homeland Security, are due to return to Egypt next week. “It was really very difficult to prove Egypt’s ownership of these objects,” Minister of State for Antiquities Mohamed Ibrahim told Ahram Online. Ibrahim explained that the Ministry of State for Antiquities (MSA) was not equipped with documents proving possession of the objects since they had been uncovered during illegal excavations in remote Egyptian archaeological sites during the security vacuum that followed the 2011 revolution. Three years of diplomatic negotiations, however, during which existing ownership documents presented by the person claiming possession were proven forged, have finally yielded results with Egypt's imminent recovery of the stolen objects. The objects in question, according to Ibrahim, were monitored by the New York customs in 2011, during a failed attempt to smuggle them inside the US. As soon as Egypt was informed of the incident, he continued, all legal procedures were taken to retrieve the objects back to the homeland. Ahmed Ali, director of the Repatriation of Antiquities Section at the MSA, said the items include a collection of wooden painted pieces of a sarcophagus from the Late Ancient Egyptian Period; a wooden sarcophagus from the Graeco-Roman era; a collection of wooden boats from the Middle Kingdom and limestone statuettes from the Third Intermediate Period.